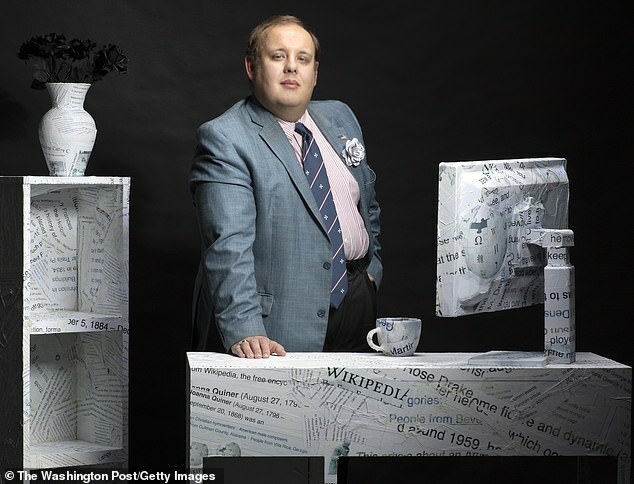 An Opera lover branded 'one of the most influential people on the internet' from Virginia is responsible for a third of all of the content on Wikipedia. Steven Pruitt, 34, has made 2.5 million edits on the free online encyclopedia and written 35,000 original articles. Pruitt - who goes by his the username Ser Amantio Di Nicolao, named after his favourite Opera character - is motivated by his deep love for history and doesn't earn a penny. 'The idea of making it all free fascinates me. My mother grew up in the Soviet Union ... So I'm very conscious of what, what it can mean to make knowledge free, to make information free,' he told CBS. Still living with his parents in the home he grew up in, Pruitt says his parents can't believe he works for free for hours on end. Pruitt was named on Time magazine's third annual list of the 25 most influential people on the internet, alongside President Trump, J.K. Rowling and Kim Kardashian. Time commended Pruitt for his efforts to address Wikipedia's gender imbalance by writing original articles about 600 influential women. The magazine also heaped praise on the history lover for making tedious editing changes to make articles easier and more organized for users. During the week, Pruitt works in records and information at U.S. Customs and Border Protection in Washington DC. His role involves discussing policy to making recommendations to processing movement of records. Pruitt believes his voluntary Wikipedia work helped him get the job two years ago because it's information management. Despite having full-time employment, the Opera lover typically puts in a couple of hours during weekday evenings and more time on the weekends. With the help of volunteers like Pruitt, Wikipedia is now one of the top five most visited sites in the world, with 6,000 people visiting the site every second.